Shrewsbury – What do Johnny Bench, Yogi Berra and Roger Clemens have in common, apart from the obvious? They all played American Legion Baseball. Perhaps a future baseball star is playing American Legion Baseball in Shrewsbury. 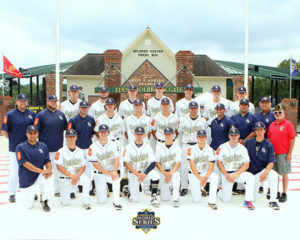 Last year’s team from Shrewsbury Post 397 made it to the American Legion Baseball World Series in Shelby, N.C. They hope to do it again this year. The team is hosting the Northeast Regional tournament at Fitton Field on the campus of the College of the Holy Cross in Worcester Aug. 7-12. There, they will defend their title playing against other state champions. The championship team will head to North Carolina for the World Series in late August. Under the leadership of longtime head coach and manager Frank Vaccaro, with assistant coaches Frankie Vaccaro, Jeff Svendsen, Josh Desai, Chris DeSantis, Matt Vaccaro and Pete Grillo, the Post 397 Team has a strong chance. Vaccaro encouraged the community to come out and support the team. With 21 wins and only three losses this season, and three playoff game wins, the team is poised to do well going forward. The team roster includes: Bailey Mikule, Tyler Mudd and Christian Siciliano from St. John’s High School; Louis Davolio from Holy Name High School; Nick Martin from Westfield State; Nick David from Groton High School; Matthew Sullivan from Burncoat High School; Dillon Zona from Assumption College; Tom Cue, Tyler Hopping, John West, Chris Wright, Dylan Degon, Pat Shaughnessy and Declan McSweeney from Shrewsbury High School; Matt Mattero from Merrimack College; Parker Browne from Suffolk University; and Pat Galvin from Roger Williams University.